Digitalis is a genus of about 20 species of herbaceous perennials, shrubs, and biennials that are commonly called foxgloves. This genus was traditionally placed in the figwort family Scrophulariaceae, but recent reviews of phylogenetic research have placed it in the much enlarged family Plantaginaceae.This genus is native to western and south western Europe,western and central Asia, and northwestern Africa. 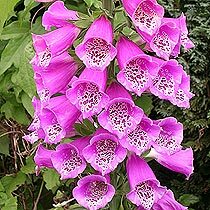 The scientific name means "finger-like" and refers to the ease with which a flower of Digitalis purpurea can be fitted over a human fingertip. The flowers are produced on a tall spike, are tubular, and vary in colour with species, from purple to pink, white, and yellow. The best-known species is the "Common Foxglove", Digitalis purpurea. This is a biennial plant which is often grown as an ornamental plant due to its vivid flowers. These range in colour from various purple tints through various shades of light gray, and to purely white. The flowers can also possess various marks and spottings. Medicinal use:A group of medicines extracted from foxglove plants are called Digitalin. The use of Digitalis purpurea extract containing cardiac glycosides for the treatment of heart conditions was first described in the English speaking medical literature by William Withering, in 1785,which is considered the beginning of modern therapeutics.It is used to increase cardiac contractility (it is a positive inotrope) and as an antiarrhythmic agent to control the heart rate, particularly in the irregular (and often fast) atrial fibrillation. Digitalis is hence often prescribed for patients in atrial fibrillation, especially if they have been diagnosed with congestive heart failure. Digoxin was approved for heart failure in 1998 under current regulations by the Food and Drug Administration on the basis of prospective randomized study and clinical trials. toxin:Depending on the species, the digitalis plant may contain several deadly physiological and chemically related cardiac and steroidal glycosides. Thus, the digitalis has earned several more sinister names: Dead Man’s Bells, and Witches’ Gloves. Digitalis thrives in acidic soils, in partial sunlight to deep shade, in a range of habitats including open woods, woodland clearings, moorland, and heath margins, sea-cliffs, rocky mountain slopes and hedge banks. It is commonly found on sites where the ground has been disturbed, such as recently cleared woodland, or where the vegetation has been burnt.